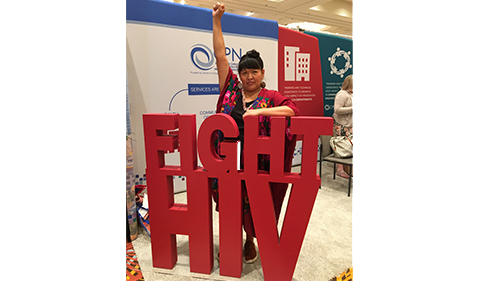 As a queer Asdzáá Diné [Navajo woman] and sexual health educator at Planned Parenthood of the Rocky Mountains, Rebecca Jones works to raise awareness about HIV and AIDS within Indigenous communities. March 20 is National Native HIV and AIDS Awareness Day, when we recognize the impact that the HIV and AIDS epidemic has had on Indigenous communities throughout our country. According to the Centers for Disease Control and Prevention, the Native community had the fifth highest rate of HIV diagnoses in the U.S. in 2015 — higher than both Asian and white communities. Furthermore, gay and bisexual men accounted for 79 percent of HIV diagnoses among Native individuals. In addition to her work at Planned Parenthood, Jones is a part of the Southwest Indigenous Initiative, an Indigenous community action group that works on HIV prevention within Indigenous communities. Planned Parenthood provides vital medical services to many in the LGBTQ community — including routine examinations, prenatal care, cancer screenings, HIV and STI testing, and contraceptive services, among other reproductive health care services. Planned Parenthood is also one of the country’s largest providers of health care to transgender people. With her expertise, Jones works to raise awareness and remove stigma about HIV and AIDS within her community. Jones notes that Indigenous communities face a lack of resources, transportation and other barriers to accessing health care, which make it difficult to get rapid HIV testing and see physicians who can prescribe PrEP, the once-daily pill regimen that prevents HIV. In addition to getting more equitable access to care, visibility matters. This National Native HIV and AIDS Awareness Day, HRC honors advocates such as Jones who are working to bring visibility and awareness about HIV and AIDS within Indigenous communities. HRC is committed to working with our allies, partners, members and supporters to end the HIV epidemic and the stigma surrounding HIV. Learn more about HRC’s work to end HIV and HIV-related stigma here.